Wool jacket is such an insufficient description. I wish you could stroke it and feel how beautifully soft it feels, inside and out. The softest wool on the outside lined with silk. I'm so pleased with how it turned out. And my fingers are crossed that Mom feels the same way as this one is for her. It's made with out-of-print (OOP) Vogue 8916, a pattern I've made before, so Mama R knew exactly what she wants in a new jacket. First, it had to be a black jacket. Check. Then she asked for an extra inch in the length of the sleeves. And that was an easy on to check off as well. The challenge came in my fabric choice. The wool was fantastic to work with, it was the silk I chose to line the jacket with that presented a new experience and a few challenges. I used Microtex needles and I have to say they were worth every penny. The challenge regarding these needles came to threading them. The hole was too small for the automatic threader to push the thread through. I've been spoiled and it took some time to finally thread the needle. I used silk thread and silk pins to sew the lining pieces after hand basting. Another challenge came in how to cut out the pattern pieces and I used the sandwich between layers of tissue paper method which worked out great. 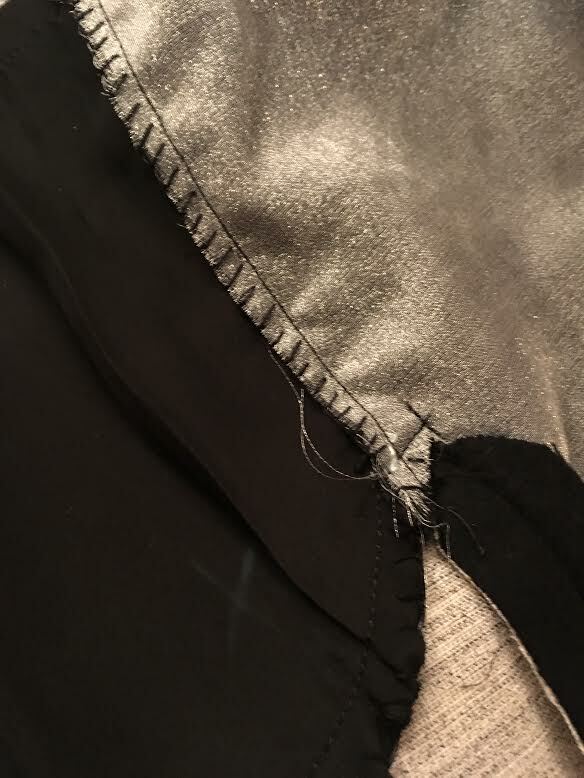 The fabric was prone to fraying and I did spend quite a bit of time hand-stitching the inside of the jacket and pocket edges. I think it was time well spent even if the inside won't be seen. The inside is underlined with organza and the front piece was interfaced with fusible horsehair interfacing. The fabrics were pretreated for shrinkage. The wool was pre-treated with the damp towel and dryer method and then steam pressed. The silk was pretreated with a tumble through the washing machine and dryer on the delicate cycles and then steam pressed under an organza pressing cloth. All handled the pretreatment process without any issues. Additional Tools and Supplies: Sewing machine, serger, walking foot, cutting table, scissors, thread clippers, silk pins, measuring tape, rulers, tailor's chalk, iron, ironing board, pressing block / clapper, sleeve ham, tailor's ham, pressing mitt, threads, hand needles and coffee.